The University’s Police station and dispatch center will open in a new location this November. The new location, at the corner of RWE Jones Drive and Ballock Street, will house the administrative offices, dispatch, and all other police operations. While in a new location, our numbers while remain the same. For any safety concern or emergency on campus, you can reach University Police at (318) 274-2222 or (318) 247-3663. Starting in January 2018, you will see a series of new faces in uniforms on campus. We are working to add ten new officers to our police force, bringing our team total to 24 trained officers. You can now access University Police in just two clicks. 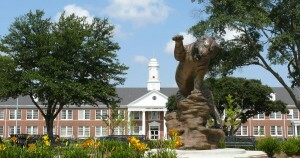 Download the Grambling State University mobile app (available at gram.edu/mobile). Click “directory” and “university police,” for fast access to our location and contact information. As the Fall 2018 semester began, University police began increasing visitation policy enforcement. Very simply, as a part of our officer patrols we may ask you or visitors to share with us your campus ID. Our goal is to ensure safety in- and around our campus and we appreciate your help. To view the campus visitation policy, download the Student Handbook. This semester, as a part of routine maintenance, our campus has received technology updates to call boxes throughout campus. Those updates include updated receivers and speakers. As of November 1, all Grambling State University police officers will wear body cameras as a part of their standard uniform. These cameras will be fully operational during officer patrols and any incident response to help protect your safety and rights. Starting in Fall of 2017, University Police patrol routes and schedules were adjusted to add more University Police support after hours and improve its collaboration with the City of Grambling Police Department, which also provides campus monitoring and emergency support. We’re continuing to work here, so if you have feedback on patrol routes don’t hesitate to email your suggestions to gsupolice@gram.edu. As a part of our routine maintenance, we continue to update campus security cameras and leverage new technology that provides an increased number of views through each camera. Next week and in the weeks ahead, you will see an increased number of officers patrolling on bicycles. These “Officer Bike Teams” help us to provide the fastest and most flexible response during high-traffic times. We are actively working with facilities and IT teams to improve lighting throughout campus. So far, we have added new lighting to six high-traffic areas based on your feedback. If you have an area that you feel could improve new lighting, please email your suggestion to both facilities@gram.edu and gsupolice@gram.edu. To help us stay up-to-date, the Federal Law Enforcement Training Center has provided their 2018 active shooter training resources to our entire police force. Thank you to all of you who shared your feedback at SGA’s General Assembly last week and each of you who attended the NAACP forum. From these to sharing at the residence hall meetings to SGA’s “Talk to Me Thursday,” your input is vital as we continue to improve campus safety. You are helping us drive these and other initiatives and are the motivation as we continue to grow. Please follow Grambling1901 on Facebook, Twitter, Instagram, and LinkedIn where we will share new opportunities for your input as we move safety ahead. This entry was posted in campus, safety, staff on October 25, 2018 by Jovan Hackley.